“All In One Woocommerce Appointments Scheduling And Booking system” plugin is a WordPress appointment scheduling plugin that allows your customers to book appointments for the services directly from your website. “All In One Woocommerce Appointments Scheduling And Booking system” plugin is the powerful scheduling plugin which has most features and user-friendly interface with flexible admin panel. By this plugin your customers will take a quick view on your services and can book a suitable appointment schedule in specific time and date slot. 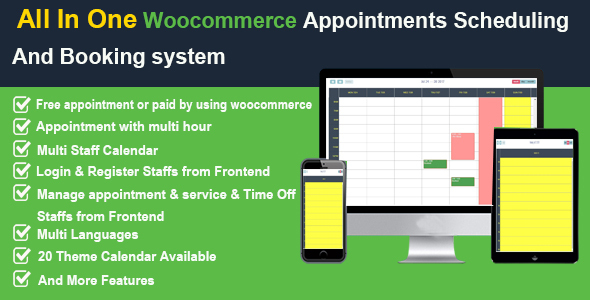 “All In One Woocommerce Appointments Scheduling And Booking system” plugin is supported with woocomerce . “All In One Woocommerce Appointments Scheduling And Booking system” plugin is make for service professionals like doctors, lawyer, consultants, therapists, tutors, instructors, singer, artist, photographers, stylists and others who need to schedule their time and date with clients through online. You can create your appointment schedule in a particular date and time. “All In One Woocommerce Appointments Scheduling And Booking system” Allows user to book more than one hour in one appointment. “All In One Woocommerce Appointments Scheduling And Booking system” Allows staff to manage appointment and services and time off or business time from frontend dashboard ,To keep your site safe. Easy to install and integrate into your site. Because necessary post or page or custom post will be automatically created and shortcodes will be automatically copied to page . Unlimited Service and Staff Entries. 20 theme calendar available to customize your calendar. Dynamic Customized date Picker for Service wise. Appointment Scheduling Calendar month and week and day view.